Okay, so you’re going to forgive the One World Observatory Trade Center Journal quite a bit, just for what it is and where it comes from, which is here. It was bought for me by my wife and daughter, when they took a trip up the observatory… I was in The Fountain Pen Hospital a block over… what can I say? Thank you ladies, this is not a bad notebook, and it looks pretty good too. 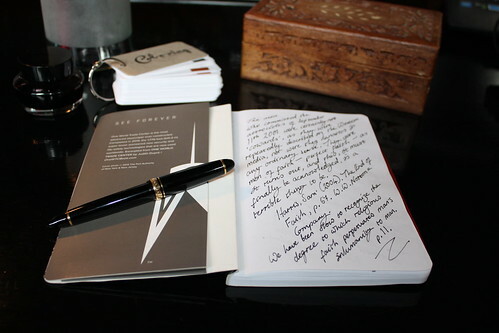 At first glance, the One World Observatory notebook is quite striking. The graphic of the tower and the NYC skyline is impressive, and it’s set off by the attached red elastic strap, which holds the pages together. This is fixed on the back cover by two, raised rings, which would have been a little awkward to write over on the last few pages, if the manufacturers hadn’t obviously thought of that, and included a card insert, which covers the fasteners. Not what you’d call an elegant solution, but it works fine. On the bottom left corner, there’s a One World Observatory logo in silver foil. The inside front cover has a fold-out document envelope, that includes a little blurb about the building, and a link to the designer’s web site—Judith Dupré at OneWTCBook.com. You’ll note the casual placement of the Sailor on the inside front cover—it wants to close. 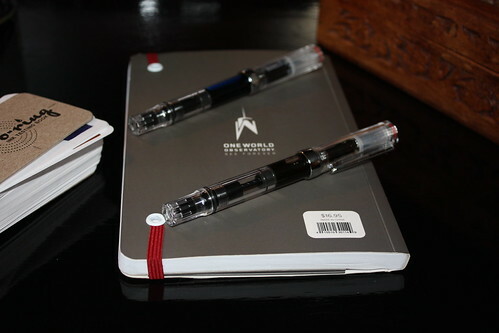 Note the twin TWSBI Ecos, and the Col-o-ring pinning the pages down… they do not want to lie flat! 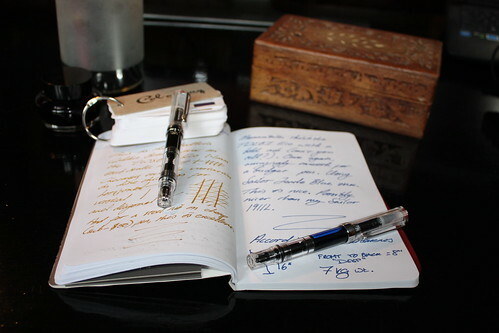 The bleed-through on the One World notebook’s paper comes from an Edison Collier 1.1mm stub nib, writing with J. Herbin Perle Noire on the reverse side of the page; and a TWSBI Eco with 1.1mm stub nib, using Noodler’s Golden Brown ink, on the face of the page. The scan doesn’t reveal quite the extent of the ink bleed, but even with bold nibs and very dark ink, the text on either side is never unreadable… just, messy. The TWSBI’s are back, but not to hold anything down this time, no this time, they’re only there to make the picture look a bit more interesting. The back of the notebook is a plain grey, with its price on a sticker in the corner. A little dull, but the TWSBIs are nice. 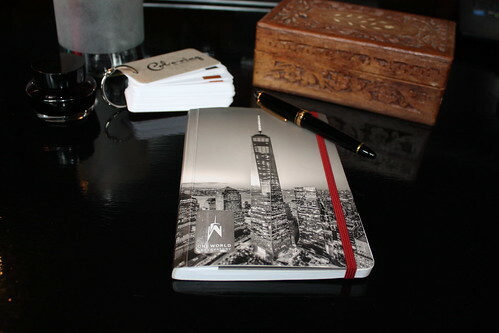 In short, the Judith Dupré One World Observatory Trade Center Journal is a nice-looking notebook, and useful enough for quick notes. But I would try to avoid using fountain pens on this paper, especially if you favor broad or wet nibs.